After looking the occupation up in an encyclopedia, Robin knew that was what he wanted to become. He did it. And along the way, he surpassed even his own goals. He won major scholarships and one of the most prestigious awards in science. He also dropped out of school more than once. Life had been hard growing up, and Robin wasn’t always able to focus on school. Robin went straight from high school to San Francisco State. After only a couple weeks, he dropped out. “After that, I took a significant amount of time off from education. I just didn’t see it being suitable for me. I would take classes here and there, but I really wasn’t finding my way, yet. His best friend’s suicide changed all that. Robin decided it was time to straighten up. He decided to enroll at Contra Costa College, because it was right behind his house. At first, he was unsure of himself. Through CCC, he met new friends who shared his goals and interests. One of them told him that the Center for Science Excellence (CSE) on campus offered tutoring, mentorship and could maybe even help him find an internship. He jumped at the opportunity to get involved. “They had me at ‘tutoring,’” he laughs. And then there were the regular seminars, in which working professionals helped him get a better idea of how he wanted to apply his degree. He especially loved the Q&As after each presentation. Through all of this, Robin also discovered Metas, a CCC program that prepares local school children to meet the demands of higher education. He saw tutoring there as an opportunity to help save other kids from his late friend’s fate. Robin wanted better for other kids, as his continued involvement in Metas attests. He now instructs fourth and fifth graders there, as a member of the faculty. For an idea of how important this is to Robin, consider the other demands on his time. He graduated from CCC with degrees in Mathematics, Physics, and Sociology, then transferred back to San Francisco State, where he earned a BS in Civil Engineering. 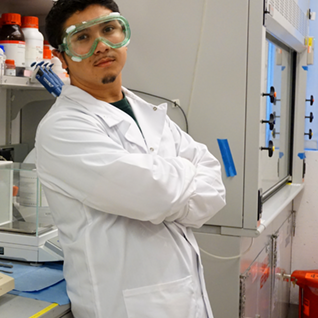 Today, he’s a graduate student at San Jose State University for Water Resources Engineering, as well as a Research Associate at the Lawrence Berkeley National Lab, working on several projects for the U.S. Department of Energy. Along the way, he has been awarded Kennedy-King Memorial Scholarship and White House Presidential Service Award. Most impressively, last March he was awarded the highly competitive National Science Foundation Graduate Research Fellowship (NSF GRFP). This grants him $138,000 to pursue his PhD. It is also very prestigious, and has made him incredibly attractive to graduate schools, who are currently competing for his interest. His ultimate goal is to come back to CCC to teach as a professor. Still, looking back at his life before and after CCC, Robin is overwhelmed.